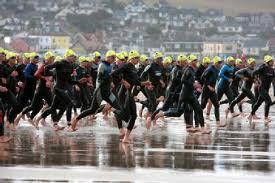 Triathlons can be thought of as a complex sport. Anytime you take more than one of anything and put them together, things tend to get a little complicated. This is why triathlon is a heavily respected sport with only a few mastering it. Add in multiple triathlons in a year, a full-time job, and a host of other responsibilities in life and those complexities just got exponentially more complex. As I know from my 2009 triathlon season, balancing everything and squeezing in training is hard work. In early 2010, it led me to burn out. A burn out in which I am still struggling to recover more than a year later. While in 2011, I had listed a number of triathlons on my race list. These triathlon included the Ventura Triathlon, Strawberry Fields Triathlon, Santa Barbara Triathlon, and my personal favorite, the Carpinteria Triathlon. In all, that is four races with many smaller (running type) races mixed in between. This means that I had a race practically every week and a half on average. Wow. So, at this time, I am throwing out my race list and getting back to simplicity. The bottom line is that I have digressed too far from my prior fitness and have a bit of a journey ahead just to get back to my old, triathlete self. So, I will focus on achieving a good showing at one event, the Carpinteria Triathlon Olympic. The Santa Barbara Triathlon will be a warm-up event to Carp to make sure I am comfortable again in the racing environment. The 1.5k swim, 40k bike, and 10k run is going to be a challenge for me. I have yet to swim consistently past 800m in a pool, have yet to conquer Toro Canyon on the bike, and have yet to run a full 5k that I feel happy with. The challenge is awesome, and I will meet it head on. This entry was posted in Commentary, Fitness, Goals, inspiration, milestones, Triathlon and tagged Goals, Triathlon, triathlon races. Bookmark the permalink.